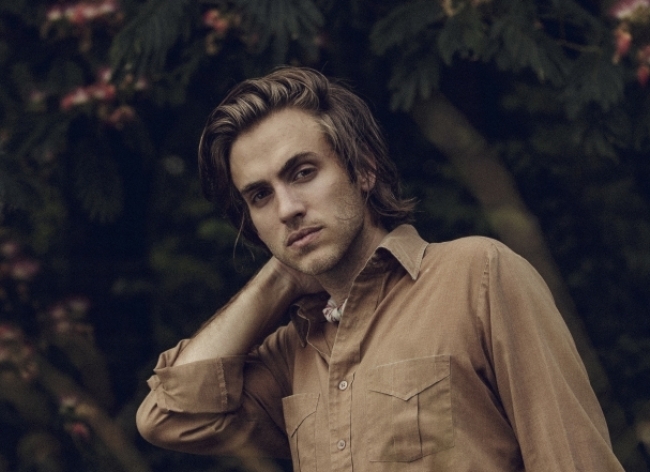 We are thrilled to have Andrew Combs as part of the Ground Control Touring roster! A Dallas native now living near the same Nashville airport immortalized in the opening sequence of Robert Altman’s country music odyssey, Andrew Combs is a singer, songwriter, guitarist, and heir to that 1975 film’s idea of the Nashville troubadour as a kind of musical monk. Here in the twenty-first century whorl of digital narcissism, where identity can feel like a 24/7 social media soft-shoe performance, Combs makes music that does battle with the unsubtle. Like the pioneering color photographer William Eggleston, he sees the everyday and the commonplace as the surest paths to transcendence, and he understands intuitively that what is most obvious is often studded with the sacred. As a songwriter, Combs relies on meditative restraint rather than showy insistence to paint his canvases, a technique commensurate with his idea of nature as an overflowing spiritual wellspring. NPR music critic Ann Powers noted as much in a 2014 review: “His song-pictures are gorgeous, but he recognizes their impermanence as he sings.” This deeply felt sense of ecology, of the transient beauty within nature’s chaotic churn, lies at the heart of Combs’s approach to his art. Keep an eye on his artist page for the most up-to-date news and tour dates.